Austrian rabbi; born at Strassnitz, Moravia, about 1790; died at Eibenschütz Dec. 26, 1859. He received his first instruction from his father, Ḥayyim, rabbi in Strassnitz, afterward continuing his studies under Baruch Fränkel, rabbi in Leipnik, where he married. About 1830 he was called as rabbi to Eibenschütz, where he remained until his death. Two of his sons, David and Joachim, became rabbis, and his daughter Hinde married Isaac Hirsch Weiss. Responsa of his are found in the collection of Moses Sofer (Yoreh De'ah, No. 345) and in the Hebrew supplement of "Der Treue Zionswächter." Deborah, 1902, pp. 7, 86. Austrian rabbi; born at Leipnik, Moravia, Dec. 18, 1816; died at Vienna Oct. 21, 1876. His father, Baer Oppenheim, having been called as rabbi to Eibenschütz, David frequented his yeshibah and in 1834 went to Prague, where he continued his Talmudic studies and at the same time attended lectures in philosophy at the university. In 1846 he was called to the rabbinate of Jamnitz, Moravia, and in 1859 to that of Nagy-Becskerek, Hungary; the latter position he retained until his death. He was elected to a chair in the rabbinical seminary in Budapest, but he died before the seminary was opened. Oppenheim was a very prolific writer, and he contributed a number of essays of permanent value to the "Allgemeine Zeitung des Judenthums," "Monatsschrift," "Bet ha-Midrash," and other periodicals; his essays on comparative folk-lore are especially valuable. In his religious attitude Oppenheim was conservative; he opposed Leopold Löw's advanced views; and the latter in return attacked him severely in his "Ben Chananja." 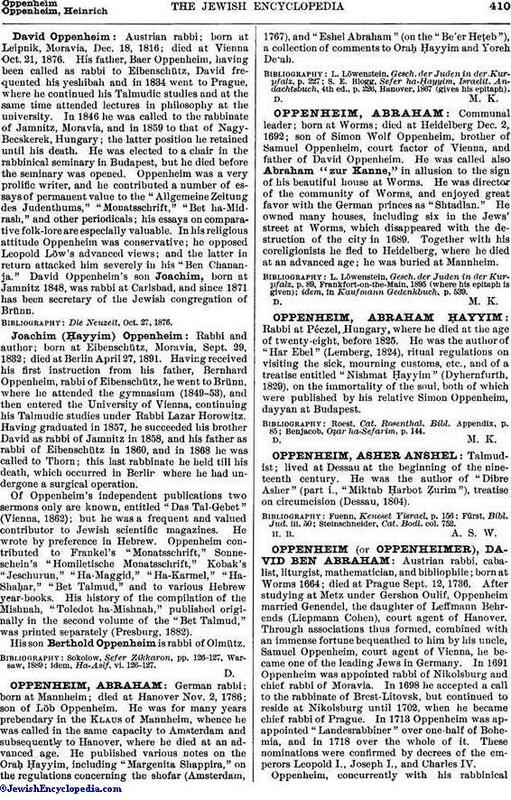 David Oppenheim's son Joachim, born at Jamnitz 1848, was rabbi at Carlsbad, and since 1871 has been secretary of the Jewish congregation of Brünn. Die Neuzeit, Oct. 27, 1876. Rabbi and author; born at Eibenschütz, Moravia, Sept. 29, 1832; died at Berlin April 27, 1891. Having received his first instruction from his father, Bernhard Oppenheim, rabbi of Eibenschütz, he went to Brünn, where he attended the gymnasium (1849-53), and then entered the University of Vienna, continuing his Talmudic studies under Rabbi Lazar Horowitz. Having graduated in 1857, he succeeded his brother David as rabbi of Jamnitz in 1858, and his father as rabbi of Eibenschütz in 1860, and in 1868 he was called to Thorn; this last rabbinate he held till his death, which occurred in Berlin, where he had undergone a surgical operation. 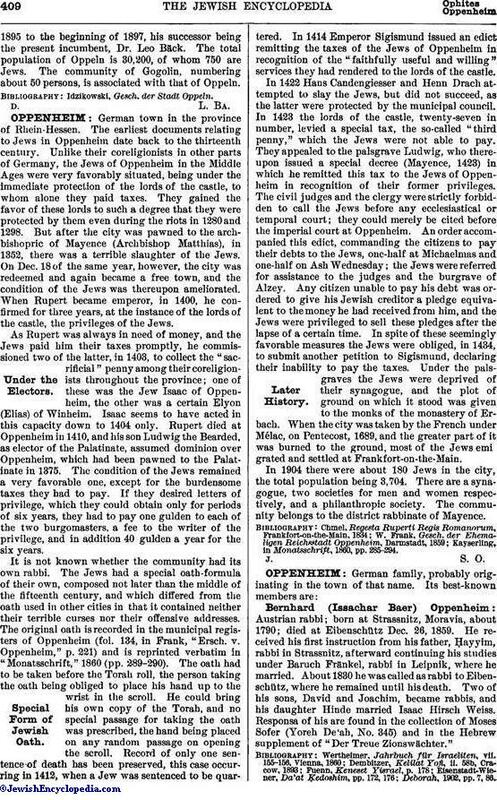 Of Oppenheim's independent publications two sermons only are known, entitled "Das Tal-Gebet" (Vienna, 1862); but he was a frequent and valued contributor to Jewish scientific magazines. He wrote by preference in Hebrew. Oppenheim contributed to Frankel's "Monatsschrift," Sonneschein's "Homiletische Monatsschrift," Kobak's "Jeschurun," "Ha-Maggid," "Ha-Karmel," "Ha-Shaḥar," "Bet Talmud," and to various Hebrew year-books. His history of the compilation of the Mishnah, "Toledot ha-Mishnah," published originally in the second volume of the "Bet Talmud," was printed separately (Presburg, 1882). His son Berthold Oppenheim is rabbi of Olmütz.